New York’s Neue Galerie is a small but glorious museum specializing in German and Austrian art. The building itself — completed in 1914 by Carrère & Hastings for industrialist William Starr Miller — is an important part of New York’s architectural history, and the collection (and visiting shows) are superb. The museum’s gift shop is also superb — and the fact that it’s called the “Design Shop” is your first clue that everything in it is unaffordable. 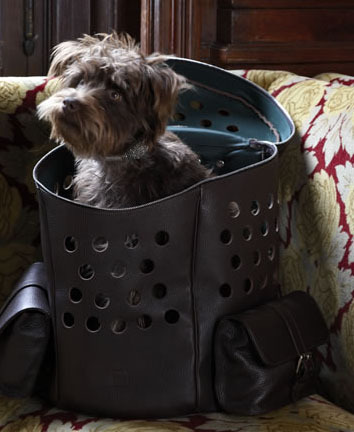 A new line of dog products and accessories includes a dog tag, a collapsible travel bowl, a couple of jackets, a dog bed, and two carriers. (When I tell you that the dog tag costs $1200, you’ll understand why this post is categorized under “Dog-friendly luxury.”) To view the “Hund” line, click on “Design Shop,” then click the “Browse/Order” button. Click on “Neue Hund” in the menu or scroll down to the “Neue Galerie Hund” square. I do admire the two carriers. Both are leather with nickel-plated brass hardware, and the Design Shop doesn’t sell anything that isn’t beautifully-made. Happily for me, the Travel Carrier doesn’t provide the kind of visual access to Chloe I like (it has solid sides, and only large grommet holes on the ends) — and at 19Lx15Wx10H, it’s a touch too large for in-cabin travel. Also happily for me, the gorgeous Rucksack is too small for Chloe. I hesitate to call it a bargain, but if you positively must buy something from the “Hund” line, check out the $95 hooded rain jacket. It’s the first hooded dog jacket I’ve seen that I think Chloe would tolerate — and she’d be a much happier pup if I could figure out a way to keep her head dry in the rain we’ve been having in Seattle this winter. 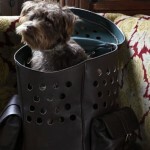 I love looking at well-constructed and beautiful products for dogs. It’s like a beautifully designed purse or shoes. You can appreciate them even if from afar! 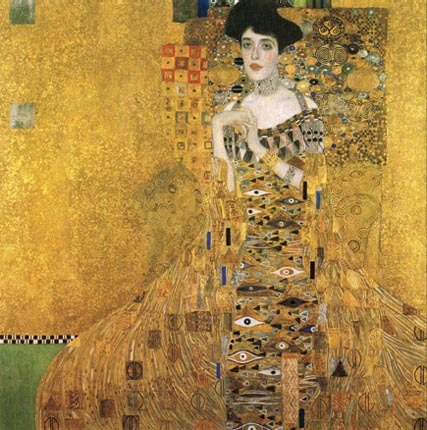 Thanks for the trip tip on the museum and the Klimt, too! And I didn’t even mention the café…. Enjoy!